The family fun continues with the Great Movies – 100 Years of Film book with this recommendation following my screening of Way Out West. 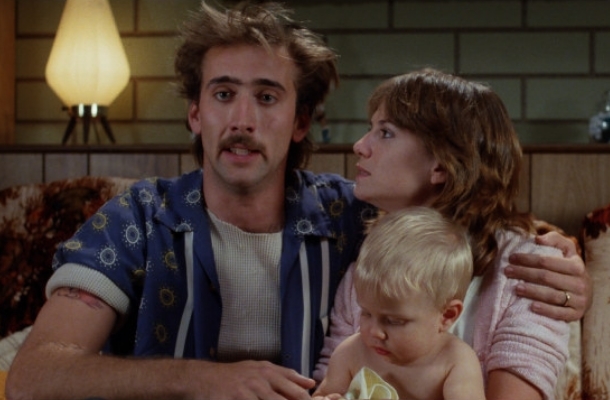 It has been years since I originally watched Raising Arizona, and I had forgotten, for all intents and purposes, all of it, so I was eager to dive into a Coen Brothers comedy, seeing as two of them (The Big Lebowski and O Brother Where Art Thou are two of my favorite comedies ever). The film follows the goofy, but enjoyable romance and marriage of Nic Cage’s wild-haired and mustachioed convict, H.I. McDunnough to Holly Hunter’s police woman Ed short for Edwina. The two vow to go straight, and Ed wants a baby in the worst way. As they try and try, nothing seems to come of it, leading to Ed being upset, quitting the force, and their trailer starter home falling into disrepair. They begin to seek out other options after the adoption process is denied to them, and when they learn about a well-off family who just had a set of quintuplets, they cook up the plan of kidnapping one for themselves, and be the parents they always wanted to be. The film is highlighted with some great dialogue, a hilarious narration by Cage, and a number of familiar faces as this goofy love story with a lot of heart plays out. Added into the mix is John Goodman and William Forsythe as two cons who bust out of prison, and subsequent camp out on the McDunnoughs’ couch, hiding from the law, tempting H.I. back to his old ways, and developing their own plans. Things get worse when Ed’s friends, Glen (Sam McMurray) and Dot (Frances McDormand) get involved and show off all their kids, the first sequence when they show up is hilariously terrifying as the kids run roughshod over everything. All through this, the baby’s parents, the Arizonas, the biggest name in furniture in the area, are trying to get their child back, and there is a strange bounty hunter played by Randall ‘Tex’ Cobb, who will not be stopped in his quest to find the child. This one was so much fun, and it’s a wonder I didn’t remember more of it, but perhaps, when I originally watched it, I wasn’t ready for it. This time around I loved it. It doesn’t oust either of the other titles out of their position, but I do like it a lot. Cage and Hunter are a lot of fun together, and watching Cage with his wild hair just act and react is a real hoot. Now while this may not be suitable for all family’s viewing, it’s definitely one that can be laughed at and enjoyed with most of them. What’s your favorite Coen Brothers comedy?